#kidlit bloggers to share wonderful nonfiction picture books. 1. books for little foodies! The dynamic duo is back, this time filling our minds with frog facts.! As always, part of their book is amazing, the other part has me fascinating and yelling "gross" learning some of the amazing information. I like the way this one was organized, makes it easy for research! Each page has a heading giving a blanket statement, what the reader will learn about in that layout. Another Jenkins book, this one has been around for awhile (published in 2006). This would be a good book to use to cross-check for newer/updated information. Are these animals still on endangered lists or not, or have they been put on an extinction list? The more I learn about dolphins, the more I am surprised at some of their habits! 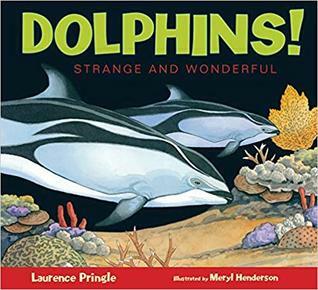 This is a thorough book all about dolphins, one I can see students reading, not only for enjoyment, but for research purposes. Includes a variety of text features and backmatter, including an index. I really love this series from Melissa. Great to show problem-solution text structure. These books really give kids (and adults!) something to think about because she shows some really practical ways kids can help the animals. I also really like how the endpages of each book shows some of the different animals and maps showing where they can be found. * note: this is the cover from an earlier edition. Peachtree and Melissa Stewart have been updating the books in the series with new and recent information. Definitely a book you want if you teach young children! It's fun, it's interactive - you'll definitely get some giggles as you read it. On each page is a riddle and the picture clue is an animal's tail. The illustration of the tail goes right up to the page turn so it invites the reader to turn the page and... find the answer and the rest of the animal's body including the head (hence the title's name...). 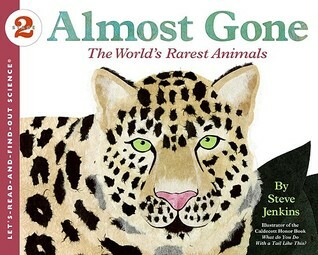 My animal books are definitely a favorite section in my classroom library. Excited to add these to the collection! Come along for the Superlative Birds blog tour! Celebrate National Poetry Month with these books. A number concept book that is so much more than a counting book. Each page adds another child but it shows how adding more people adds more fun. A great book to talk early on about including others in play. This one will be a hit with young readers and it will be perfect to read on Talk Like a Pirate Day! Oh yes, this is a needed book. You know that moment when your child gets a gift they really don't want and you're just hoping they react the way you want them to? And you know how sometimes you get a gift from grandma that doesn't make sense but in the long run you discover it was the perfect idea? A young girl makes a really long birthday wish list just to get a lemon tree. But after some time and taking care of it, the girl learns a valuable lesson. Oh this book was so sweet! Elbert is a curious bear and because of that he has trouble conforming to the boring rules he must follow in his job. He goes off on his own to lose his curiosity only to find the big world out there gives him more things to be curious about! 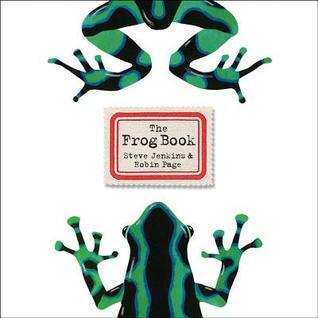 So many ways to use this book in a primary classroom. A silly book that will be well enjoyed by young readers. Dot has to push through her fears in order to save her little sister-egg! Perfect for young readers - a book about flying on an airplane, readers will learn basic vocabulary as a family of three travels on a plane. From the duo that brought us A Hundred Billion Trillion Stars, this book about energy and your body is a great new book for your science nonfiction collection. I love finding new science books, an area that is lacking in my collection. Last Monday was Marathon Monday in Boston. It's an historic race and so prestigious to get in and run it. I thought it was only appropriate to read this book last Monday. Kathrine Switzer was the registered woman to run and complete the Boston Marathon. Literally fighting off opposers as she ran, she kept to her goal and finished the 26.2 miles. As a former marathoner, I know the determination and mental game you play when endurance running. I have so much awe for these runners and love reading about their determination. I really enjoyed Annette Pimentel's Girl Running which is about Bobbi Gibb, the first female to run the Boston Marathon, however, she was not legally registered. I think sharing both of these books is a great spotlight on women who question rules that intentionally keep a group of people out. 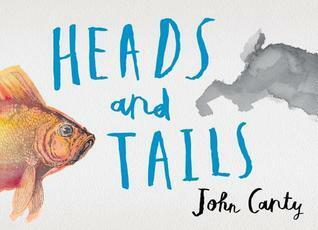 Churnin always produces fascinating picture book biographies, this one being no different! She takes a look at MLK and Anne Frank, who have a lot more in common than I ever stopped and thought about. It helps to have some background of the two to really understand the connections, but it's not necessary. Ever wonder what happens in different environments to the native animals when it starts to rain? Stewart shares different animal adaptations that keep animals dry when in rains. This would go along great with studies looking at different biomes. If you haven't met Peter and Ernesto, fix that today! They are lovable sloths, one a bit more adventurous than the other. This time, they both have to be ready for an adventure because a hurricane has just hit their tree and they are not on the lookout for a new tree with their fellow sloths. As with any adventure with these two, the unexpected always leaves them with a new funny story! I feel like everything Cynthia Lord writes has these nuggets of truth that just sit in my heart. This book was no exception. Emma is going to school for the first time in fifth grade. She's always been homeschool but now is the time for change. Of course it doesn't go the way she planned. But to help ease the pain, she's fostering a bunny that her game warden father saved. Emma didn't plan for the bunny to worm his way into her heart so quickly. I think readers are going to fall in love with this quick read. Books this length (under 200 pages) are so needed. Many readers need books that aren't overwhelming in length as they build their own reading stamina. Lord is fantastic at picking every right word, not wasting anything, and writing a book that makes you continue thinking about it long after you close the (under 200 pages) book! I got this from the library some time ago but never had a chance to read it. I remember seeing a write up of it and it sounded humorous. Thanks to the Cartwheel Book Awards, I finally got to it, and yes, it was very humorous. I'm glad it was chosen to be on the list because it is such a kid appealing book. Tristan has just moved out of New York City into a small town. The only thing that sounds good about this town is the doughnuts... and even that turns out to be nonexistant. As a way to keep him busy until he is allowed to start school, he figures out how to put together a business plan and start selling doughnuts. Along the way, he makes friends and learns this little town might not be so bad. Predictable, yet the humor and fun made me excited for the upcoming book 2! I'm more than halfway through this book and I'm really enjoying it. Lots more on deck! MG and picture books are in the stack for this upcoming week! 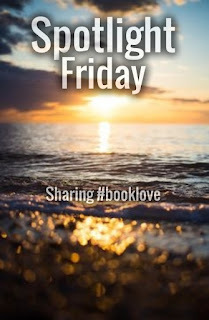 I've been celebrating National Poetry Month at the Book Nook. If you've missed a post here's part 1 and part 2. Today is the final post in the series. Hope you've had a chance to read some books with your students. Were you able to celebrate Poem in Your Pocket Day yesterday? If not, take some time and share some poetry the rest of the month! Artist Ashley Bryan has chosen some of his favorite poems by Christina Rossetti and illustrates them with cut paper. Loved reading the illustrator's note at the very beginning of the book where Bryan shares he used his mother's sewing scissors to create the cut paper artwork, saying "her hand in mine." Beautiful. I love books like these. They have such a place within a curriculum. The way it plays with words and plays with poetry. And in case you're wondering more about the format, Wolf includes notes about the poems at the end of the book. 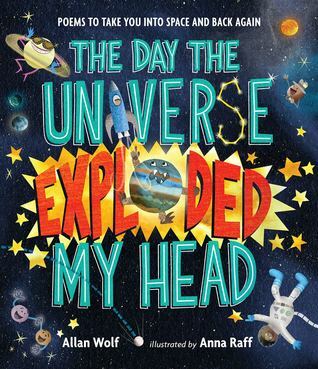 But then within each poem, there are nuggets of knowledge - full of information about space (of course, the reader will have to be a bit selective in understanding what is true and what may be some fictional information...), this collection would be so fun to use during a science unit. I hope libraries purchase this one, I think it will be a fan favorite! This is the third poetry book of Salas this year and another one that is a must have for me (disclaimer, I own all three, but they are all so good!). As she explains in the back of the book, these are Riddle-Kus - haikus that are riddles. Separated by season, kids will love guessing the answer, and if you really have trouble, the answers are located in the back of the book! 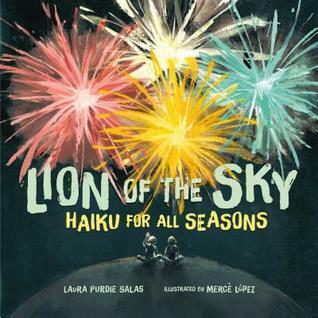 With beautiful, soft illustrations from López, this book is one to share every year! 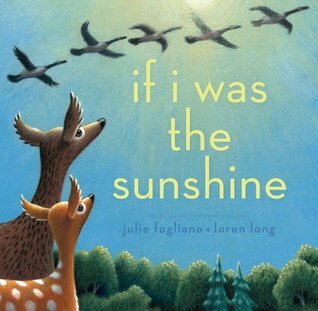 This is a book for your language mentor text collection - put it with books you use when talking about similes or verbs. Gorgeous language! Another one that is full of knowledge within the poems. Studying reptiles? You'll want to read this one. 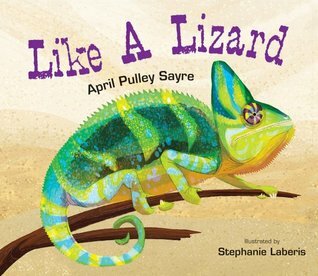 Not only is the poem fun, but you'll see lots of different lizards in the illustrations. Each lizard is labeled and is featured in unique settings. At the end of the book, Sayre includes information about each lizard. Oh, this book is just beautiful! As I mentioned in an earlier post, sometimes a poem can be an entire book. A book does not have to be a collection of poems, it can be one longer one that is stretched and illustrated as an entire story. This is one of them. Fogliano looks at connections between things in nature. I think this is also a beautiful look at perspective. Two things are compared (example, flower and nose) and then each say what they would call each other (sniff, rose). Accompanies by Long's gorgeous artwork, this was a book I took my time with. This one will be a homerun with young readers. 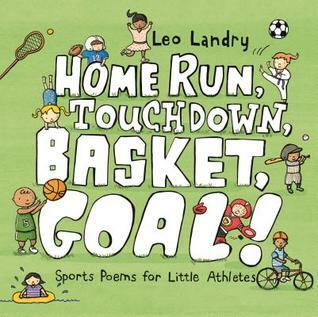 Fun, rhyming poems that center around sports. Geared for a younger reader, the rhymes are fun but perhaps a bit clunky in some areas. I'm glad to have some sports poetry to share with readers. I hope these posts have helped you find some new poetry books to share with readers! Dive into the most and least birds in this book as you discover all the superlatives in a bird's world. 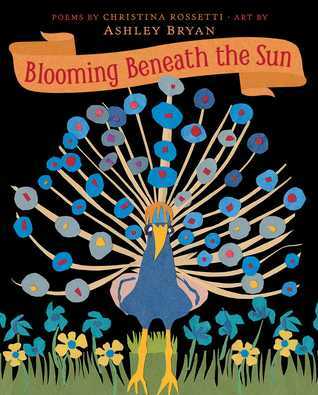 Author Leslie Bulion and illustrator Robert Meganck have collaborated to create a book that will boggle you with information and leave you with many different reading and sharing opportunities as you go through this book. 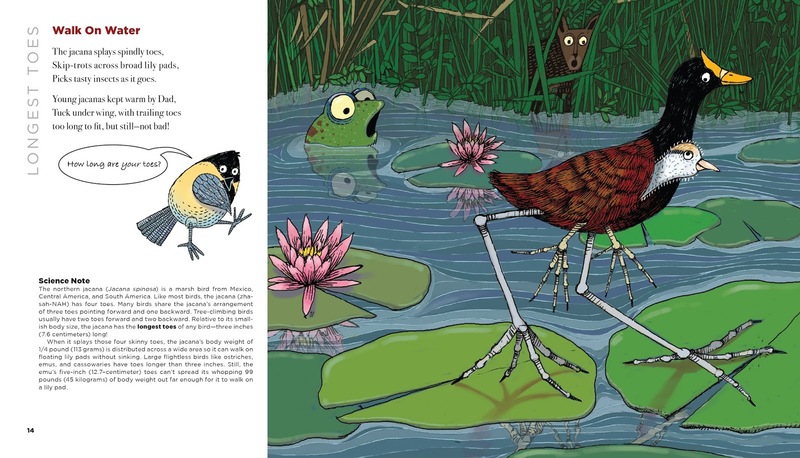 From endpage to endpage, every reader will find fascinating information and crazy facts about the birds in the world around us! Want to share it for the gorgeous poetry about these amazing creatures? Every poem is different - a different bird, different superlative, and different poetic form. I love how they each fit so perfectly for the bird it is describing. Want to share it as you talk about superlatives during a language lesson? Who doesn't love being the best or most or greatest at something? Some fun superlatives in this book include "biggest loudmouth", "most gruesome prey collection", and "smelliest"! Want to talk about creative ways author and illustrators keep readers entertained when putting a book together? Don't miss the chickadee that finds its way on every layout, imparting extra information about the featured bird. Sometimes the information is about the bird, sometimes it's about how the bird relates to other animals in our world. A reader could just go through the book reading the quotes from the chickadee and learn a lot of information! There is even one layout that uses a QR code. It's a beautiful song that accompanies the poem. More about that in a minute! Want to share it during science when researching the world around us? For every layout, Bulion has added a science note that gives further information about the bird. 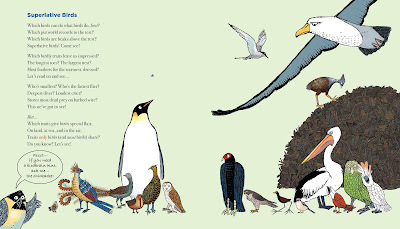 While the accompanying poem may contain some facts, a reader will go to the science note to dive deeper into the bird's world. I also liked how Bulion connected these creatures to the harm we are putting into our environment. For every conscious move we make to keeping our Earth clean, we're adding to the longevity of these amazing creatures! Does the information fascinate you? Looking to see how an author includes even more information in their book? Don't miss the backmatter! The backmatter includes a glossary, notes about the poetic forms of each poem, where to find more information if you are interested in birding and acknowledgements from the author. I hope you have lots of time to share this book, in fact I can see it being read over a spread of days. As you can see, there is so much to take time and read and share. 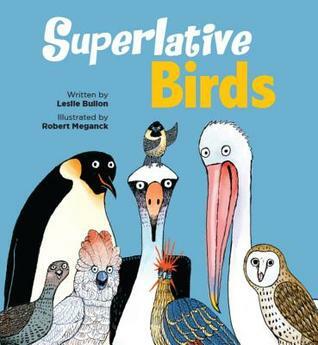 Today author Leslie Buillon stopped by to answer some questions about Superlative Birds. Thanks for stopping by, Leslie! Thank you so much for inviting me to visit your lovely Book Nook, Mrs. Knott, and for your interesting questions about bird poetry process, bird book illustration and bird-related singing! 1. I loved seeing all of the birds you selected, some were new to me and some were familiar! How did you pick out the birds to include in the book? And, how did you determine some of the superlatives? Ah yes, the dilemma—who’s in? who’s out?—is a BIG question. The short answer: the superlatives determined the birds! Superlative Birds explores signature characteristics we associate with birds such as song, flocking, beaks, and migration, to name just a few. So those characteristics helped me choose the superlatives. But even that’s tricky because you can come up with several different superlatives for each characteristic. Take beaks, for example: I could have included the bird with the longest beak, the heaviest beak, the smallest, the pointiest, or even the knobbiest beak! I curated the final assemblage of birds based on strong scientific evidence for their superlative “record,” with an eye to geographic and habitat variety. I wanted to present an informative, entertaining and worldwide cast of avian characters. You noticed that I also balanced familiar birds such as the turkey vulture with lesser-known birds like the Arctic tern and truly oddball birds such as the (phew) hoatzin. I hope readers enjoy meeting remarkable new feathered friends, as well as discovering surprising and remarkable attributes in birds they may already know. 2. What was the writing process like for this book? There must have been so much organization between the poem, the bird quotes, and the science information! Soooo much organization! My writing started with wide, foundational reading about birds. I added hands-on, experiential research, spending a week at the Cornell Lab of Ornithology. And in the life-long joy department, I’ve become an eager birder both here in Connecticut and in my travels. I record my birding data on Cornell’s ebird citizen science database. I created a preliminary list of birds and their superlatives, then did more in-depth research on each. I juggled and winnowed until I had the depth and breadth I wanted. As with all of my poetry collections, I thought a lot about how poetic form might relate to particular poem subjects. Once I began writing I was fairly methodical: poem, narrative science note, poetry note. Repeat, bird by bird (insert homage to Anne Lamott here). The process of distilling each complex science concept into the spare elegance of a poem raised many questions for me as I worked. I contacted researchers with specific questions and shared my poems and narrative notes. I wanted to be sure the nuance of each word and phrase conveyed accurate science. I planned a few ideas for back matter, then the manuscript went off to my editor, and eventually on to the art director and illustrator. Whew! 3. The text and illustrations work together so seamlessly. Were you able to communicate with illustrator Robert Meganck? Collaborating with Robert Meganck on Superlative Birds was a hoot (pun intended)! We worked on Leaf Litter Critters (Peachtree, 2018) together, too. When we’re in the thick of it we’ll email back and forth, several times in a day. You would not believe how much fine-tuning went into those chatty chickadee word bubbles! Robert always had another great idea to try, then—zip zip—my inbox would ding with his new work. His sketches and notes raised interesting questions that sent me back down the research rabbit hole, often highlighting something readers would want to know. 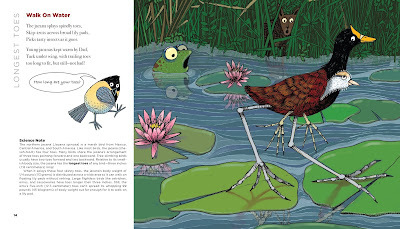 The work is fun and challenging, whether we’re figuring out how to show relative sizes of our superlative birds or counting fingers and toes on frogs. On that note, I hope readers will stay tuned for Amphibian Acrobats coming March 1, 2020! 4. I love the QR code for the song! Tell us more about how that came to be. Ah, Mrs. Knott, you are giving me the opportunity for a proud mama moment here. I’m thrilled you asked about my daughter…er…I mean the QR code! Most of my collections include a poem based on the rhythm and rhyme pattern of a song. This is one of my favorite ways to model writing science poetry with students. But if I’ve chosen a song few readers will know, many could miss the fun of singing along. Enter the QR code. “Arctic Terns the World ‘Round” is based on a beautiful old sea chantey, “White Wings.” When you scan the QR code you hear my daughter, Julia Hirsch, an actress and singer, who recorded the song for us in her home studio. Peachtree Publishing hosts the QR code link and—voila!—readers can listen and sing along. 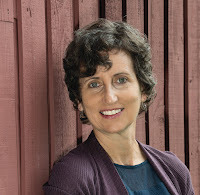 Leslie Bulion has written poetry since the fourth grade. In addition to her other science poetry collections, Hey There, Stink Bug! ; At the Sea Floor Café; Random Body Parts; and Leaf Litter Critters, Leslie has written several novels for young readers. She and her husband Rubin lice in Connecticut, where she often steps into her boots to meander through favorite birding spots, collecting data and photos along the way. Visit her website at www.lesliebulion.com. This is a book I have no doubt you'll want to add to your libraries. 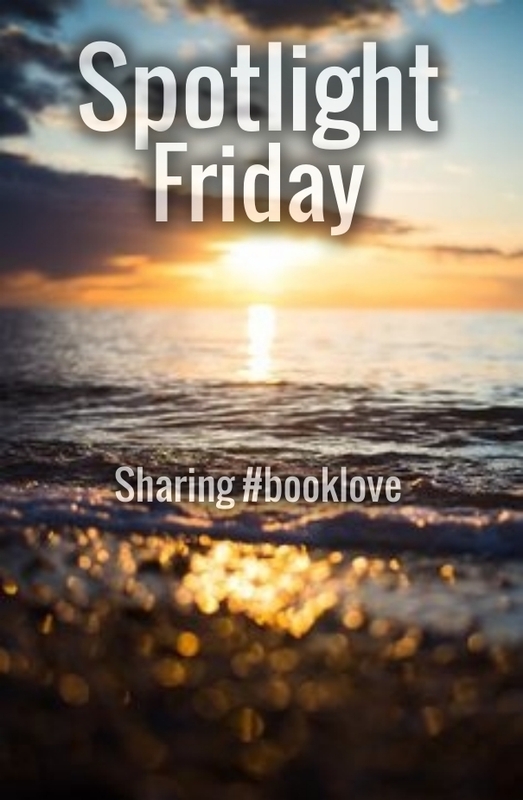 Whether you're using it for a read aloud, research, a mentor text or just for a good read, it's a book to share! So these posts are from two weeks ago. No time for blogging last weekend! International Paralympic swim meet, Confirmation and a family baptism kept me very busy! Most posts coming this week! 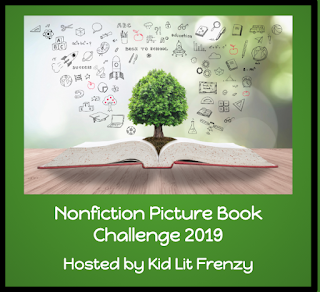 My readers love reading nonfiction picture books about animals. Check these out. It's April, are you reading more poetry? Some books to check out! Cactus learns that a small act of kindness can be just the thing to make you feel good on the inside and outside. Full of southwest illustrations, this is a book I definitely want to add to my library! I love this new one by Ame Dyckman! And Charles Santoso's illustrations go perfectly with the story. 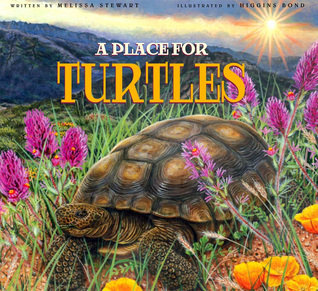 This book shows that a parent's love really knows no boundaries... especially against a field of dandelions! Perfect for the upcoming Mother's Day and Father's Day celebrations! Do your students have Marvel Avengers fever like mine? Well, actually I do too! I love talking about these superheroes to readers. Now I have a book to recommend to them too. This book focuses on the heroines of the Marvel world. Each page is dedicated to an amazing female and their traits that make them so amazing. What I love about this is the spotlight on their strength, smarts and bravery. Perfect for young readers! The narrator of this story is a polar bear. She tells us her story of traveling over sea ice to get to the mainland. Full of information, this narrative story will have readers on edge as they see the sea bear traveling on the sea ice to get food (seals) and then travel through the sea itself to get to the mainland. There she has her babies and then wait for the sea to freeze again to travel back home. The illustrations are really a standout in this book - done in graphite, watercolor, drawing inks, conte crayon and color pencils. Definitely a book to check out! A counting book that features words in Spanish, but has illustrations that will help all language learners to figure out the new words. Parra's illustrations are perfect for this book. An important counting book that features representation in the words and illustrations. Add this book to your Social Emotional Learning and your immigration collections. It will be a good one to have. Similar to some other books I've read about having a fear or anxiety that keeps someone from experiencing new situations, this is another good one for that topic. Add being an immigrant in a new country, and now there is a new layer to discuss. A Native #ownvoices story, I'm so glad I saw Traci Sorrell's tweet about this one! Two brothers are laying under the sky one night when the older brother shares their uncle's wisdom about the dancing lights. A book about celebrating those who have passed away and their belief of how their elders are in the "forever sky". Beautifully told and illustrated. This book is for anyone who loves reading. And it's really for the reader who smells books since that comes up in the story - it is definitely a thing to you nonsniffers! The Book Hog LOVES books, but... his big secret is he doesn't know how to read. One kind librarian sets out to change that. Love love love this one. While the human family drives away for their trip to the great outdoors, all of the forest animals take over the house for their trip to the great indoors! What kinds of things do forest animals want to do on their vacation inside? Definitely a humorous take on a different perspective of vacation! This series is so sweet and adored by readers and pet-lovers! In this sequel/stand alone, Madeline finally gets a puppy but her love for animals doesn't stop there. She learns about animal shelters and how the animals there are still looking for forever homes. Madeline's kind heart finds ways to love even more animals. It was so fun to read this picture book biography about the creator of crayons, Edwin Binney, and how they came to be. Kids will love seeing the familiar crayola box, crayons and wrappers, and enjoy learning how the name "crayon" even came to be! I'm curious as to see where this book is classified - is it a biography? Does it go somewhere under inventions? I'm not familiar enough with the Dewey Decimal system to know the answer to that. The book goes through some of the trials and errors Binney and team went through to get the crayon and the pigments of colors to be just right. I loved the illustrations by Salerno. The bright colors popped perfectly for a book about crayons! The backmatter is fascinating. It will require an extra day of reading because there is so much information to be found in it - step by step instructions with photographs showing how crayons are made, more about creator Edwin Binney, and extensive source notes. This is a must have addition for your libraries! Sell collaborates with other artists to put the stories of this book together. All of the characters live in the same neighborhood and bond over cardboard boxes and imagination. Through imaginative play, characters learn more about themselves and their own identities. While each mini story stands alone, characters are seen in multiple stories which can be confusing to young readers. The visual piece will be helpful for those readers to follow everyone! I'm in a bit of a reading slump. I think it's because of of the massive amount of reading time I had over Spring Break. Great books and lots of time to fall into them. Now I'm having days where I get one chapter read. This one I had time to fall into, but I was extremely distracted. I think that kept me from loving it more than I did. I say all of that because I did end up really enjoying it, but I'm thinking most readers will like it even more. This fantasy was a bit slow starting for me, but Doyle really sets up the story so you understand the characters and what is happening with them. Fionn and his sister are visiting their Grandad on an island. And there Grandad has a very important job on this island, he's the Storm Keeper. But it appears that it's time for a new Storm Keeper. Full of folk lore, mystery and of course, some bad guys, the pace of the story picked up until it was hard to put down. Set up to be a series, I'll be interested in seeing where it goes. I'll be interested in seeing what other readers think of this one. Let me know if you read it! Anderson has given us another "Anderson" novel - one that pushes the boundaries just enough to make it edgy and fun! Rion and his family are traveling to his grandfather's hometown to lay him to rest, although it doesn't quite go as planned. There's a funneral to attend instead of a funeral, and a scavenger hunt to find Papa Kwirk's ashes. But along the way Rion and his family learn more about Papa Kwirk and themselves as a family unit. Endearing and sweet, but definitely a bit on the long side. True Anderson fans will love this one. This one had been in my pile for awhile. Sorry it took me so long to get to it - wow, it's good! I've always found elephants fascinating creatures and this one solidified my feelings. Simply amazing. But then this book has a science fiction component to it. Can't give away the secret but woah it threw me for a loop. Check this one out for sure! Full of teen angst and tough choices - Peter and Sophie have grown up together. They have both taken turns being more in like with each other, however, now it is Sophie's turn and she's pretty sure it's love. But she doesn't want to ruin what they do have, so she remains tormented by her feelings. Add on top of this that Peter, for the first time in his life, is experiencing what it means to be a "normal" kid. See, Peter has kidney failure and he's doing much better because Sophie has given him one of her kidneys. Can Peter live his own life without forever feeling indebted to Sophie? Especially once he realizes how deep her feelings are for him? Exploring what it means to be an individual, this was an easy book to fall into. Mature themes and sexual exploration keeps this in the YA area. Lots of kids at my school are reading this one right now because it was at our Book Fair. Keeping up with the students! Happy Spring Break reading to many readers. Here's to a good week!